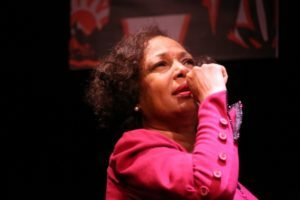 The audience meets Elizabeth Van Dyke as Zora Neale Hurston at the bus station where the character reflects on her life as she waits to return to her Alabama family home after years of existing as a well renowned fixture in Harlem. At the onset of the play, we see a tired woman, a fighter who bears the scars of a battle strewn life. Changed from the enthusiastic young writer bursting with ideas and artistic zeal hell bent on taking the literary world by storm. The viewer now finds Hurston, who takes us back to her heyday, feeling a bit dejected and betrayed by those who at one time heralded her as one of the bright lights of the Harlem Renaissance. Sharing the stage with Van Dyke is Joseph Lewis Edwards, who plays the characters of Langston Hughes, Richard Wright and Rhodes Scholar Alain Locke, the acknowledged Dean of the Harlem Renaissance. 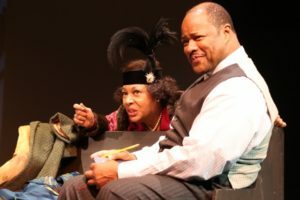 Both Van Dyke and Edwards bring their characters alive as part of the 125th Birthday Anniversary Celebration of “Zora Neale Hurston: A Theatrical Biography” written by Laurence Holder and directed by Woodie King, Jr. The New Federal Theater has partnered with the All Stars Theater where the play will run Thurs- Sat at 8pm and Sat. and Sunday matinee at 2:30pm until November 20th. New Federal Theater has recently relocated within the Castillo Theatre located at 543 West 42nd Street, in Manhattan. Not to be restrained by marriage, Hurston nevertheless jumped the broom in 1927 when she married jazz musician and Howard classmate Herbert Sheen. Sheen went on to become a physician but his marriage to Zora ended in 1931. She again married. Her marriage to Albert Price was short-lived. While her writing was regaled, her political views often put her at odds with her peers. Some looked at her taking on white patrons who controlled her writings and limited her expansion, as Zora selling out. Zora saw it as having to survive. Also, while Richard Wright and others sanctioned integration, Zora opposed the idea that integration was a necessary goal for African Americans. In fact, some black intellectuals saw her leanings toward idioms and southern black dialect as minstrel in scope and railed against her writings. Some of her ideas angered the white community and suddenly, the queen of the Harlem Renaissance found herself the brunt of criticism and eventual condemnation when she was falsely accused of sodomizing a 10-year old child, despite the fact she wasn’t even in the country at the time she was accused of committing the crime. Her fortunes fell and she found it difficult to get published as well as recover from the false accusations levied against her. She became a pariah in the eyes of the public and within literally circles. Although Hurston went onto write until her death she was never able to return to her former glory. And that is why it is important to support plays like “Zora Neale Hurston: A Theatrical Biography” so we relight the literary flame under those artist whose works fell into obscurity. And, to once again remind ourselves and future generations that there once walked among us great literary geniuses such as Zora Neal Hurston. Go see it!